After losing their first two game of the season Woori came out with a chip on their shoulder. Getting off to an amazing start they dominated KDB from beginning to end giving them a 50 to 23 lead at the half. 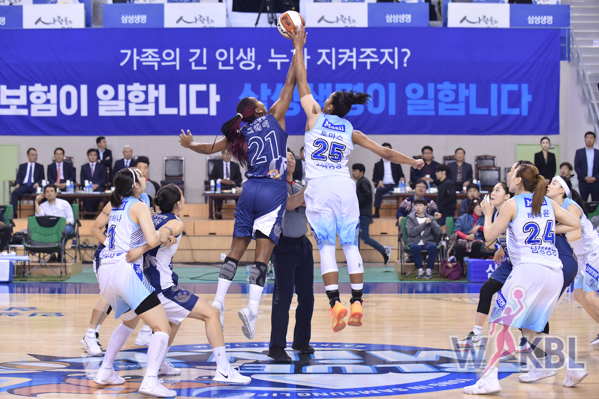 Woori Bank had a balanced attack as five players scored in double figures; led by Natalie Achonwa who finished with 21 points and 11 rebounds. Jewel Loyd finished with 17 in the loss. Both KDB and Hana were in search of their first win of the season. KDB started off attacking and winning the first quarter 17 to 11. KEB played a better second but KDB took a seven point lead into the half. Led by Jewell Loyd, KDB went on to win their first game of the season. Loyd finished with a double double of 25 points and 10 rebounds. For KEB Harrison also finished with a double double scoring 15 points and pulling down 13 rebounds. Both teams started the season with a win so tonight’s game was a game that many looked forward to. Both teams did not disappoint as they fought tooth and nail. Alyssa Thomas did it all again for Samsung as she led all scorers with 28 points. She also grabbed 14 rebounds and dished out 5 assists in 40 minutes of play. Kayla Thornton and Rashonda Gray both played well for Shinhan. Thornton finished with another double double of 17 points and 13 rebounds. Gray was just one rebound shy of a double double; finishing with 19 points and 9 rebounds. There is definitely more parity in the WKBL this season as every team seems to have a chance to win the championship. KB looked to continue their winning ways against last year’s champs who were looking to redeem themselves after losing their season opener. Woori, who started the season with a loss were at home for the first time this season. In front of a large home crowd KB got off to a great start. Again, their post play made the difference in the game. Woori had no answer from Damiris Dantas who finished the game with 17 points and 15 rebounds. Park Jisu finished with 16 points and 10 rebounds. Woori won the last quarter after switching their defense to a zone but it was too little too late. Achonwa finished with 19 points and 7 rebounds for Woori.